Authors: Budi Darmawan, Andri Firtiyan, Charles Price Jr.
Security is the hottest topic in the current Web-centric computing environment. This issue becomes the single largest concern for IT professionals who are stakeholders for Web applications, such as administrators, programmers, and users. 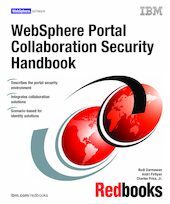 In this IBM Redbooks publication, we discuss this security issue with the implementation of IBM WebSphere Portal Extend for Multiplatforms in an IBM Lotus collaborative environment. This discussion is scenario-based and aims to assist in the deployment of WebSphere Portal with Lotus Collaborative Components in a secure implementation. We describe several degrees of security, noting their advantages and disadvantages. The primary goal of this scenario is to have a WebSphere Portal server with Lotus Team Workplace (formerly called QuickPlace) and Lotus Instant Messaging and Web Conferencing (formerly called Sametime) environment set up and running securely. We discuss proxy authentication with IBM Tivoli Access Manager for e-business Version 5.1 and discuss the use of various identity providers, such as IBM Tivoli Directory Server, Domino LDAP, and Microsoft Active Directory.